ASTM A106 standard specification covers the seamless carbon steel pipe, applied for high-temperature services. 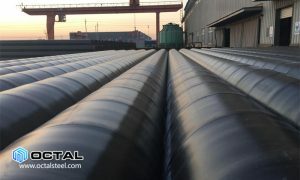 For ASTM A53 there are ERW and seamless steel pipes Type F, E, S covers Grade A and B.
A53 Type E, Electric resistance welded (ERW), in Grade A and Grade B.
A53 Type S, Seamless steel pipe, in Grade A and Grade B. 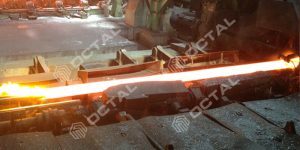 If raw steel material of different grades in process of continuously casting, the transition material result shall be identified. 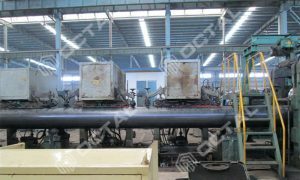 And the manufacturer should remove the transition material with the processes that could separate the grades positively. 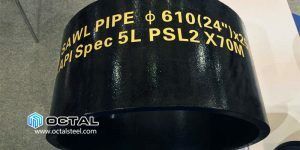 In case ASTM A53 Grade B in ERW (electric resistance welded) pipe, the weld seam shall be done the heat treatment with a minimum 1000°F [540°C]. In this way the no untempered martensite remains. In case ASTM A53 B pipe in cold expanded, then expansion should not exceed 1.5% of the required OD. ASTM A53 Grade B chemical properties content C≤0.30%, Mn≤1.2%, P≤0.05%, S≤0.045%, Cr≤0.40, Cu≤0.40, Ni≤0.40, Mo≤0.40, V≤0.08. ASTM A53 B mechanical strength is the same with ASTM A106 B steel pipe, Tensile strength maximum 415 Mpa, Yield strength maximum 240 Mpa. Elongation: For A53 pipe there are 2 methods to calculate elongation. B: See ASTM A53 elongation value table X4.1 or table X4.2 for different specimen area. 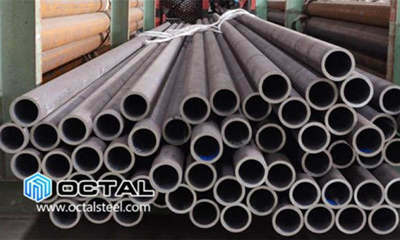 For ASTM A106 steel pipe, manufacturing Type only in seamless, processes hot rolled and the cold drawn. Grade in A, B and C.
ASTM A106 Grade A: Maximum Carbon element 0.25%, Mn 0.27-0.93%. Minimum tensile strength 48000 Psi or 330 Mpa, yield strength 30000 Psi or 205 Mpa. A106 Grade B: Maximum C below 0.30%, Mn 0.29-1.06%. Minimum tensile strength 60000 Psi or 415 Mpa, yield strength 35000 Psi or 240 Mpa. Grade C: Maximum C 0.35%, Mn 0.29-1.06%. Minimum tensile strength 70000 Psi or 485 Mpa, yield strength 40000 Psi or 275 Mpa. 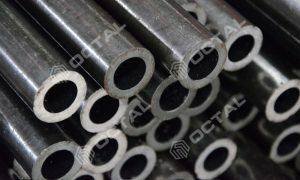 ASTM A53 Grade B mechanical strength is same with ASTM A106 Grade B pipe. As ASTM A106 B is the common use, the chemical here we listed is C≤0.3%, Mn 0.29-1.06%, P≤0.035, S≤0.035%, Si>0.1, Cr≤0.40, Cu≤0.40, Ni≤0.40, Mo≤0.40, V≤0.08. Differently with ASTM A53 B, ASTM A106 B has Si min 0.1%, which A53 B has 0, so A106 B have better heat resistance than A53 B, since Si improve the heat resistance. A106 Grade B has low sulfur and phosphorus than A53 B, this is better. Both pipes applied for mechanical and pressure systems, transporting steam, water, gas, and etc. 1. Construction, underground transportation, extraction of ground water while building, steam water transportation etc. 2. Bearing sets, machinery parts processing. 3. Electric application: Gas transmission, water power generation fluid pipeline. 4. Wind power plant anti-static tube etc. 5. Pipelines that required zinc coated. 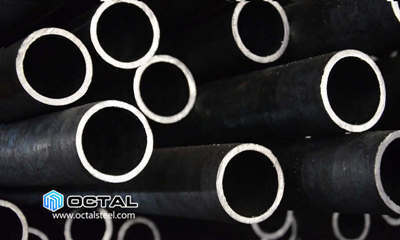 Especially for high temperature services that up to 750°F, and it could substitute ASTM A53 pipe in most of the cases. In some country at least in United States, usually ASTM A53 is for welded pipe while ASTM A106 is for seamless pipe. And if client asked for ASTM A53 they will also offer A106. 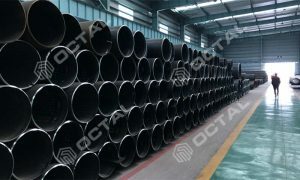 In China, manufacturer will offer the pipe that comply to three standards ASTM A53 B / ASTM A106 B / API 5L B.